In common with other power generation technologies, nuclear energy relies heavily on electric valve actuators for safe and efficient plant operation. In particular, electric valve actuators are used for crucial safety-related duties, both inside and outside the nuclear containment area or nuclear island. In both cases these duties demand actuators that are built to strict material specifications and approved to the most stringent testing and qualification standards. 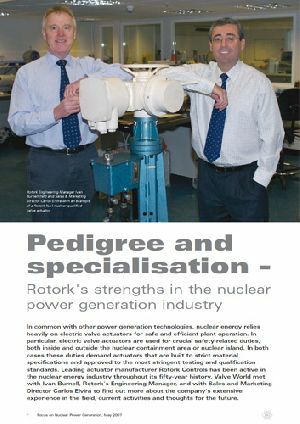 Leading actuator manufacturer Rotork Controls has been active in the nuclear energy industry throughout its fifty-year history.